A 73-year-old woman who appeared weak and lethargic in the days before presentation was found passed out, pale, and diaphoretic. Emergency medical services (EMS) were called. The woman recently had a stroke with right-sided deficit and had a history of multiple strokes, dementia, seizures, hypertension, and diabetes. EMS found her to be hypoxic with oxygen saturation at 85%, which improved with a nonrebreather mask. Upon removal of the nonrebreather mask, she had another desaturation issue in the emergency room (ER), presenting with weakness and shortness of breath. On admission, CTA confirmed extensive pulmonary emboli (PE), right heart strain with a right-to-left ventricle ratio of 1.53, and indication of a right lower lobe infarct (Figure 1). The patient had an elevated troponin level of 2.4 ng/mL and a brain natriuretic peptide level of 286 pg/mL. Other than brief tachycardia to 110 bpm, the patient was hemodynamically stable. A heparin drip was started in the ER, and the interventional radiology department was consulted for further management. Thrombolysis treatment was contraindicated due to her recent stroke. 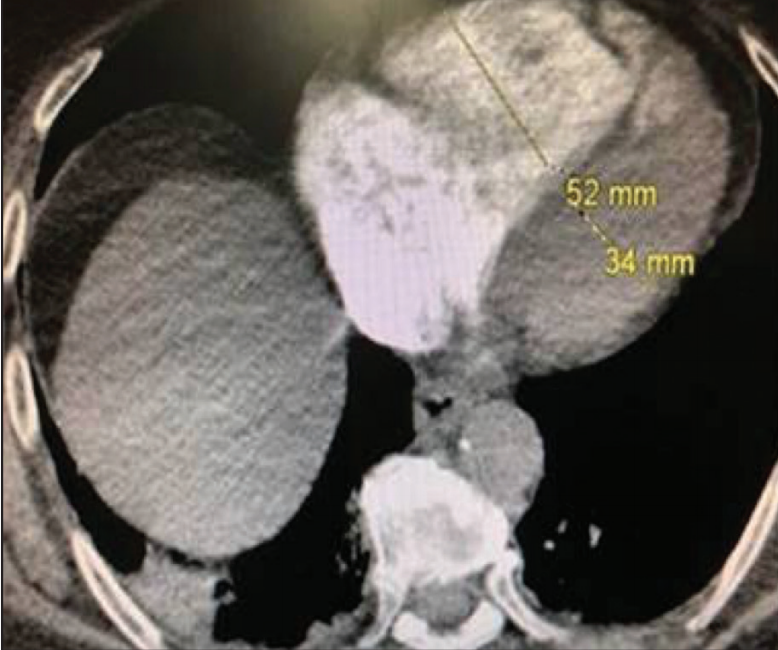 Given the extensive right heart strain, clot burden (Figure 2), and contraindication to thrombolytic drugs, mechanical thrombectomy with the FlowTriever System (Inari Medical) was selected for treatment. Figure 1. CTA showing significant right heart strain. Figure 2. CTA showing occlusive clot in the PAs. Pulmonary angiography was performed to plan the intervention, and it showed extensive emboli in the right and left pulmonary arteries (PAs) with extension into the segmental and subsegmental branches (Figure 3). After imaging, the right femoral vein access site was dilated to accommodate a 22-F DrySeal sheath (Gore & Associates). The FlowTriever System was advanced through the sheath to the right PA. FlowTriever mechanical thrombectomy was initiated, and significant clot was removed via two aspirations. Follow-up imaging suggested the clot was efficiently cleared, with improved perfusion (Figure 4A). Figure 3. Initial angiograms of the right (A) and left (B) PAs. Figure 4. 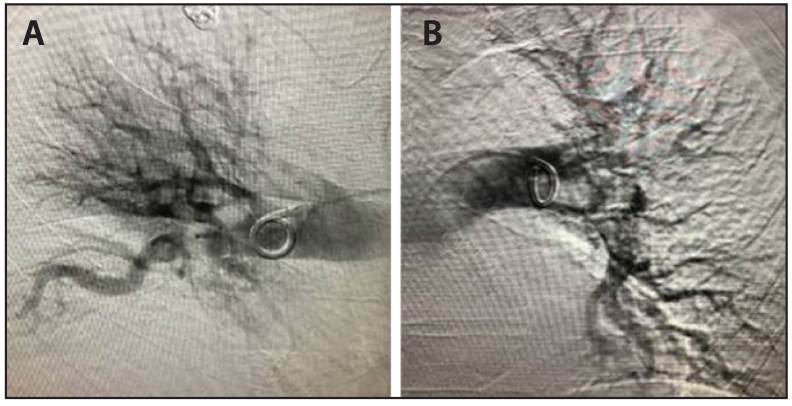 Post-FlowTriever angiograms showing significant improvement in perfusion in the right (A) and left (B) PAs. Next, treatment was initiated on the left side. An initial aspiration attempt removed modest clot. 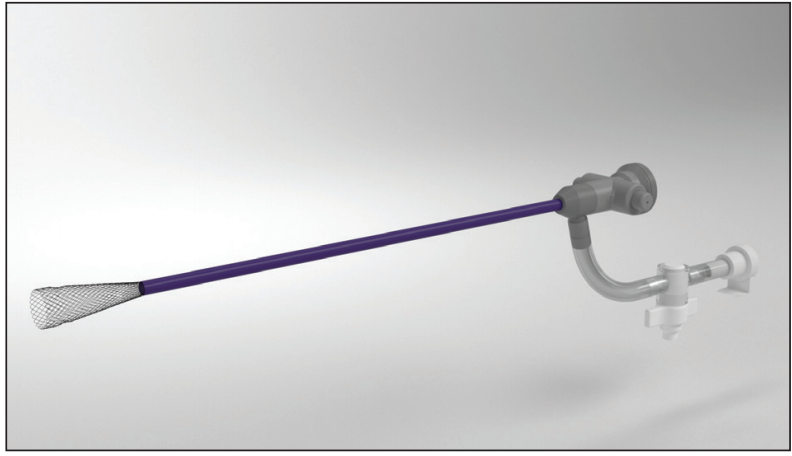 A medium-sized FlowTriever catheter was then deployed to engage and disrupt the clot for evacuation by the Triever20 catheter (formerly known as the Aspiration Guide Catheter, Inari Medical). Follow-up imaging confirmed minimal residual clot and improved flow with a return to normal saturation (Figure 4B). Pulmonary arterial pressure (PAP) also significantly improved—PAP was 38/19/26 mm Hg prethrombectomy and 29/15/20 mm Hg postthrombectomy. The Triever20 and sheath were removed from the patient. Closure was achieved with a purse-string suture and manual compression. The next day, the patient was sitting up in her bed awake and alert, and her oxygen saturation was at 100% on room air. A patient with acute PE, significant right heart strain, elevated biomarkers, previous stroke, and possible head injury was successfully treated with the FlowTriever System. A significant amount of thrombus was removed (Figure 5), blood flow was rapidly restored in the right and left PAs, and the patient showed immediate improvement in symptoms without the use of any thrombolytic drugs. 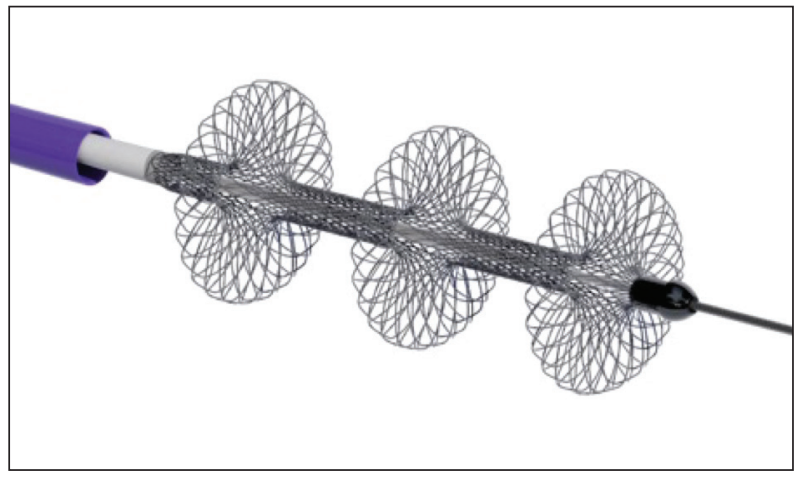 The FlowTriever System represents a valuable new option in the interventional toolbox for effectively treating PE. Disclosures: Consultant for Inari Medical. What are your primary treatment goals for PE and deep vein thrombosis (DVT)? My approach to DVT is a little different. In the post-ATTRACT era, we are reminded about procedural risk and the importance of patient selection. We have always been aggressive in treating iliofemoral DVT in younger patients to decrease the morbidity rates associated with the disease. This method is supported by the recent ATTRACT trial publication by Comerota et al, which mirrored the benefits we see daily in clinical practice when aggressively treating these patients.3 The lukewarm ATTRACT trial results were expected given the dilution of femoropopliteal patient inclusion and the bleeding risk associated with thrombolytics. It is difficult to study such a diverse patient population in this manner. For instance, I would approach an 80-year-old patient with cancer who has minimal swelling very differently than an 18-year-old woman who was on oral contraceptives for 2 months and had a near phlegmatic leg. Young patients with untreated iliofemoral DVT commonly develop postthrombotic syndrome (PTS), and you see them again in their 40s with venous ulcers, pelvic reflux, and extremely poor quality of life. Dr. Saucier: My primary treatment goals for PE are to decrease mortality, provide symptomatic relief, and prevent long-term complications of the disease. Many patients present with shortness of breath, chest pain, and significant right heart strain. My goal is to remedy these symptoms on the table as safely as possible. I believe rapid treatment and acute, significant reduction of clot burden is likely to reduce and hopefully prevent longer-term clinical sequelae such as pulmonary hypertension and chronic thromboembolic disease. My treatment goals for DVT focus on the short- and longer-term morbidity associated with the disease. Acutely removing as much thrombus as possible provides quicker relief of symptoms such as pain and swelling. There is evidence to suggest that patients with more complete thrombus removal are less likely to have recurrence of DVT, and it may also reduce the rate and severity of PTS that patients experience longer-term. How has your treatment strategy evolved for clot removal in PE and DVT? Dr. Saucier: Our institution’s treatment strategy for PE has evolved significantly. Until recently, the only available endovascular option was a thrombolytic-based approach with or without ultrasound. We would weigh the bleeding risk and complications associated with thrombolytics against the potential benefit of treatment. As a result, we intervened on fewer patients than we would have liked. Our low intervention rate caused lingering uncertainty as to whether we could successfully achieve the desired results of clot removal and symptomatic relief. For instance, when we did intervene, we were only completely satisfied with the final angiographic appearance 30% to 50% of the time. Now, our threshold for PE treatment is much lower due to the increased effectiveness and decreased risk profile of mechanical thromboaspiration without thrombolytic drugs. We can treat a broader range of patients, including those with a contraindication to thrombolytic drug, and we are confident that the risk is lower and that we will achieve the outcome we expect. For us, the FlowTriever System has become our frontline approach (Figure 1 and Figure 2). Figure 1. 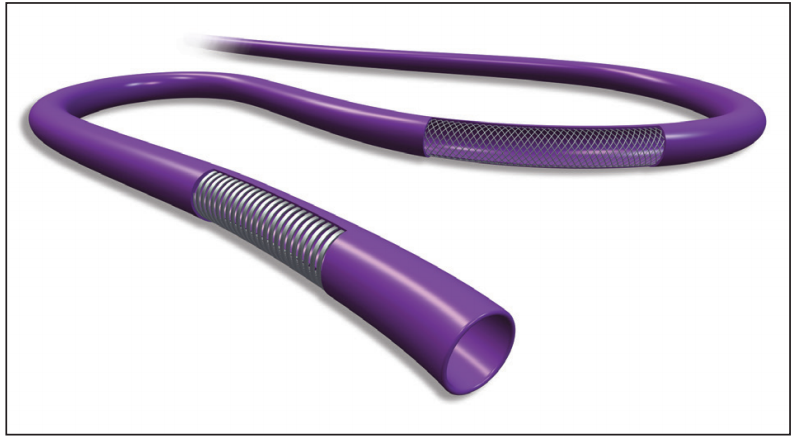 The FlowTriever catheter. Figure 2. The Triever20 catheter (formerly Aspiration Guide Catheter). Our approach to DVT has also changed. Historically, there have been more tools available to treat DVT than PE. In addition to catheter-directed thrombolysis (CDT), there are a number of mechanical thrombolysis/thrombectomy devices and techniques, including balloon maceration, the ZelanteDVT thrombectomy catheter (Boston Scientific Corporation), the Cleaner rotational thrombectomy system (Argon Medical Devices, Inc.), and the Indigo aspiration system (Penumbra, Inc.). However, we commonly give thrombolytics in conjunction with these methods. We do not achieve the desired result in a single session, thus requiring us to infuse thrombolytics again overnight. The resulting toll on the patient and physician, not to mention the added cost of a stay in the intensive care unit (ICU), was significant. Oftentimes, we would spend a few hours performing mechanical thrombolysis, followed by overnight CDT and a repeat venogram the next day. We would still experience residual clot and suboptimal flow, which was not very satisfying. Today, our first-line approach for DVT is mechanical thrombectomy with the ClotTriever device (Inari Medical; Figure 3 and Figure 4) because of its ability to reliably remove nearly all thrombus in a single session without the need for any thrombolytic drugs. We have seen very promising results so far. Figure 3. The ClotTriever catheter. Figure 4. The ClotTriever sheath. Dr. Jolly: My treatment strategy for venous thromboembolism (VTE) has evolved significantly with the recent introduction of better mechanical thrombectomy tools. Not only do they permit me to treat a wider range of patients, including those contraindicated to thrombolytics, but their increased efficacy and improved safety profiles have rebalanced the risk/benefit trade-off associated with intervention. For PE, we generally treat hemodynamically unstable patients with systemic thrombolytics per all major societal guidelines, assuming there are no contraindications. We currently reserve catheter-based therapies for rescue procedures or patients who need advanced therapy beyond systemic lytics (eg, ECMO, Impella RP [Abiomed, Inc.]). Our threshold for treatment of intermediate-risk patients is typically those with elevated enzymes and right heart strain. We have gradually evolved our treatment for these patients from our approach of using half-dose (or even less) thrombolytics delivered locally through catheters to mechanical thrombectomy. Our results are closely tracked by objective transthoracic echocardiographic assessment of right ventricular function at index and then again at 30 days. For DVT, we have had the chance to use several kinds of devices. Historically, we have favored the ZelanteDVT thrombectomy catheter, using infusion catheters to deliver thrombolytics if we can’t achieve an on-table result. When infusion catheters are needed, we try to limit run times to 6 hours but will not exceed 12 hours. To determine if the on-table result is sufficient, we perform intravascular ultrasound (IVUS) in 100% of our patients in addition to venography to look for brisk flow and absence of collaterals. We feel strongly that the presence of iliofemoral DVT must be explained at the time of intervention when possible. It is vital to explain why someone has iliofemoral disease so that they can be properly treated. An iliofemoral DVT should be considered a mechanical obstruction until proven otherwise. The reason may vary from typical May-Thurner syndrome, nonthrombotic iliac vein lesion, tumor, or even uterine fibroids. IVUS has changed our practice in the past decade and is an absolute. More recently, we have shifted our practice to single-session treatment using the ClotTriever System, essentially eliminating the need for thrombolytic drips in DVT patients. We are consistently seeing excellent on-table results without any notable complications. How has the FlowTriever System influenced your PE practice? Dr. Saucier: Until now, we only had thrombolytic-based options with or without ultrasound. The FlowTriever enables a broader range of patients to be considered for treatment, including those who are relatively or absolutely contraindicated to thrombolytics. I am also impressed by its ability to remove significant amounts of thrombus from the proximal PAs, lobar arteries, and even segmental arteries to increase perfusion and achieve desired clinical results. Our patients have commented that they experience less chest pain and shortness of breath on the table, and we have noticed a consistent drop in intraprocedural PAPs, which is encouraging. Rarely do patients require an ICU bed following FlowTriever treatment. We have even discharged patients the same day, which is not common in PE treatment. Achieving significant clot removal while avoiding the bleeding risk and ICU stay associated with thrombolytics has greatly improved our treatment algorithm. Dr. Jolly: We approached the FlowTriever with a healthy degree of skepticism. It was very useful for us to participate in the FLARE study as early users because it taught us the potential benefit firsthand.4 Despite the bleeding risk, we were pretty comfortable with using thrombolytics in PE patients because we did it for years without any viable alternatives. As such, we initially reserved the FlowTriever for when thrombolytics failed or a patient couldn’t tolerate thrombolytics. When compared to smaller PE devices, the learning curve was slightly steeper, so we had to hone our skill set with PA angiography and become comfortable directing wires and catheters to the clot. Since the FLARE study, the FlowTriever device has evolved considerably to simplify the procedure and increase clot hauls, which has immensely increased our usage. Much like our evolution in DVT from locally delivered lytics to ClotTriever thrombectomy, my preferred first-line strategy for intermediate-risk PE is now FlowTriever thrombectomy. It is hard to justify exposing intermediate-risk patients to an up to 2% intracranial hemorrhage rate, and thus a lytic-free option ought to be frontline. In our 30 or so FlowTriever cases, I don’t believe we ever needed to administer adjunctive thrombolytics. This is a big win for the patient and hospital because it avoids ICU stays and shortens the total length of stay. In our experience, we are also seeing that acute intervention with the FlowTriever appears to reduce the rate of post-PE syndrome, at least anecdotally. I suspect this has to do with the rapid on-table clot removal. We do not always remove all clot, but I think the significant and rapid debulking gives the body’s intrinsic lytic system a chance to clear additional distal clot more effectively. How has the ClotTriever device influenced your DVT practice? Dr. Jolly: ClotTriever has the makings of a true game changer, and this is not a term we use lightly. We have seen so many DVT products come and go with promises of being the holy grail, but the end result has proven underwhelming. Candidly, it was hard for us to believe the ClotTriever would be any different. However, the degree and range of clot burden removed are consistently impressive. Based on IVUS, we see no residual clot remaining, which is remarkable. The ClotTriever System is incredibly efficient not only in its ability to remove clot but also in the setup time. There is no capital equipment to lug into the cath lab; it is a single, very easy-to-use catheter we can pull off the shelf. The success rate on the table with the ClotTriever is unparalleled. 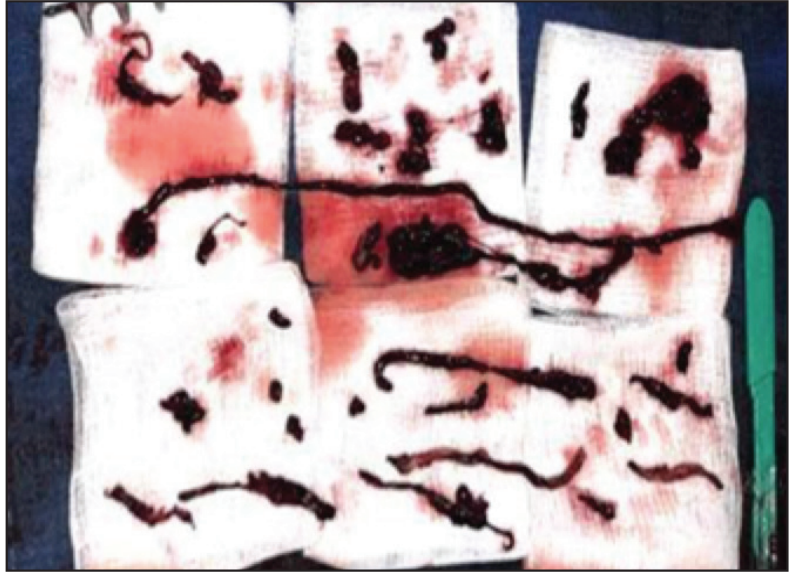 In our 30 or so cases, I can only remember one occasion where the on-table result wasn’t pristine, and we believe this was more likely due to clot chronicity. The on-table results have been far more superior and consistent than the other devices we have routinely used for DVT. The implications for the patient are substantial. Consider the routine patient sent for overnight thrombolysis. The patient cannot move, needs to use a bedpan, becomes severely bruised at every venipuncture site, and feels generally awful. The process is miserable, and the next day, they look like they were run over by a truck. Compare this to a patient treated with the ClotTriever. They do not experience blood loss, rheolytic hemolysis, or acute kidney injury, and there is no need to endure multiple treatment sessions. Our ClotTriever patients avoid thrombolytics altogether, and they typically go home the next day. The ClotTriever is a win for the hospital as well because it reduces the total length of stay and eliminates the need for ICU stays. The elimination of thrombolytic drugs for patients with DVT cannot be understated. The possibility of any additional major bleeding beyond standard anticoagulation, especially intracranial hemorrhage, should be considered unacceptable in the treatment of a non–life-threatening condition such as DVT. I believe if you can offer an effective procedure for treating a morbid disease process that doesn’t confer substantial risk, that is a win. This is our goal. We have thus shifted the ClotTriever to be our frontline treatment modality of choice in all DVT patients, not just those contraindicated to thrombolytic drugs. Dr. Saucier: Previously, we placed a thrombolytic catheter overnight, sometimes for 2 or 3 days, and we hoped for the best. Now, we experience on-table success with dramatic results. Our patients are treated in a single session, with excellent flow and little to no clot remaining. We also haven’t experienced any notable safety issues across the 20 or so patients we’ve treated to date with the ClotTriever. The efficiency of the ClotTriever is very evident for me as a clinician, because I went from often > 2 to 3 hours of total procedure time to 60 to 90 minutes. Notably, the ClotTriever procedure is easier on the patient as well. Avoiding the miserable feeling that patients experience with thrombolytics, the consequent ICU stay, and the repeat visits to the angiography lab table are compelling advantages. We often use less contrast as well, which is safer for the kidneys. It is also advantageous to the hospital because it keeps these patients out of the ICU and frees up the room for a patient more in need. What advice do you have for interventionalists interested in adopting the FlowTriever and ClotTriever Systems? Dr. Jolly: I think it is important to commit to performing a few cases up front with an Inari representative available. It takes three to five cases to get the hang of things, and it is worth the investment. Inari also offers additional flow model training and an advanced users forum to compare notes with peers. I recommend starting with straightforward, lower-risk patients to optimize for success. Of course, this should be a patient indicated for advanced therapies you would normally treat. In PE, a patient with right ventricular strain, elevated biomarkers, large proximal clot, and no hemodynamic instability, who can lie supine and is oxygenating well, is a perfect first case for the FlowTriever. For the first case, I would advise limiting yourself to the proximal clot and not wiring multiple segmental branches. The Inari representative can be incredibly helpful in thinking through the procedure, troubleshooting, and ensuring procedural success. In my first few cases, I took about 2 hours to complete the procedure. Now, I spend about 1.5 to 2 hours for stable patients, because I have time to deliberate, and 0.5 to 1 hour in unstable patients. For the ClotTriever, I recommend a similar approach in terms of case selection. I recommend treating patients with relatively recent iliofemoral disease (for example, acute DVT with symptoms for the past 7–10 days) and no stent or filter, who are capable of being positioned in a prone manner. I think the ClotTriever learning curve is faster, but there are some key pointers for ensuring procedural success. It is definitely advantageous to stack your cases and have an Inari representative available for training purposes. After a few cases, I felt like I saw most things that would arise, and I was ready to perform cases on my own. Dr. Saucier: These systems may be a little intimidating at first, especially if you haven’t intervened in the PAs before. Make sure you have practiced with the device in the Inari flow model and are comfortable obtaining pulmonary angiograms. The better the image, the better you can plan and achieve good results. I think you will find yourself very comfortable after a few cases. In my initial few cases with the FlowTriever, I spent about 2 to 2.5 hours getting familiar with the device and confirming each step with our Inari representative to ensure I was doing everything properly. Now, I can complete a bilateral PE case with the FlowTriever in about 1 hour. For the ClotTriever, there are a few more steps involved, particularly in cleaning the device between passes. However, the device pullback time is very efficient. My first few procedures took about 3 hours, and they now take 1 to 1.5 hours, including IVUS and stenting when appropriate. At a macro level, how does VTE fit into your practice? Do you anticipate much growth? How many patients go untreated? How big is the unmet need for better treatment options? Dr. Saucier: VTE has become a meaningful part of my practice, and the better tools becoming available make the results more gratifying. To really grow your practice, it requires setting treatment algorithms and communicating early and often with your peers in the ER and on the floors in order to ensure the right patients are being identified and sent for evaluation for endovascular treatment. It seems to me that few hospitals do this in a robust, systematic way. This is likely due to an evolving treatment landscape, the lack of a natural physician “owner” for many VTE patients, and dated, unclear, or contradictory guidelines. At St. Luke’s, we have robust treatment algorithms for PE and DVT that help to better triage our patients. There is certainly room for exponential growth in venous treatments given the volume of undertreated patients and the lack of general awareness, particularly in smaller community hospitals where physicians may be unaware of the various new, safer treatment options. Most patients seen in this setting will be admitted on a heparin drip and sent home on warfarin or possibly a direct oral anticoagulant. This will change as more attention is given to the field and more data are collected and disseminated to better standardize care. Dr. Jolly: One needs to look no further than most major medical device companies’ growing venous portfolios to know that the venous medicine landscape is hot. Venous disease is far more prevalent than arterial disease. Now that tools are emerging to better treat venous disease, we are seeing explosive growth. But in many hospitals, venous care is significantly fragmented among multiple subspecialties, protocols are largely nonexistent, and patients are tremendously underserved. Many patients who would benefit from treatment do not have access due to lack of awareness and conservative, outdated treatment paradigms. I think as more tools become available and industry sponsors more clinical research, we’ll amass data to better inform guidelines and help more patients in the long run. Overall, there is a substantial unmet need in the venous arena, and unfortunately, the relative inertia around treatment paradigms needs to be addressed. VTE treatment, and more broadly venous disease in general, is a rapidly advancing field. Clearly, the one-size-fits-all approach to anticoagulation used over the past several decades is ancient history. Therapies are becoming more tailored to patient risk profiles and morbidity, and our ability to help patients should dramatically improve in the future accordingly. 1. Secemsky E, Chang Ym , Jain CC, et al. 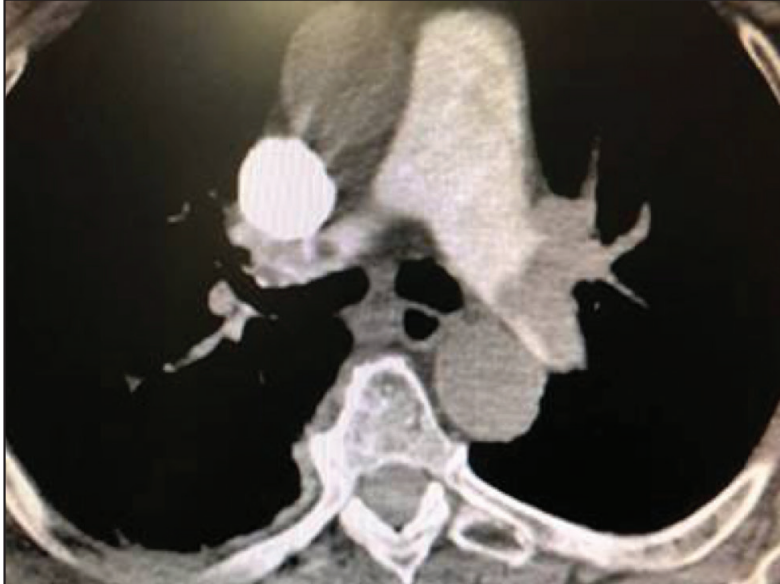 Contemporary management and outcomes of patients with massive and submassive pulmonary embolism. Am J Med. 2018;131:1506-1514. 2. Meyer G, Vicaut E, Danays T, et al. Fibrinolysis for patients with intermediate-risk pulmonary embolism. N Engl J Med. 2014;370:1402-1411. 3. Comerota AJ, Kearon C, Gu CS, et al; ATTRACT Trial Investigators. 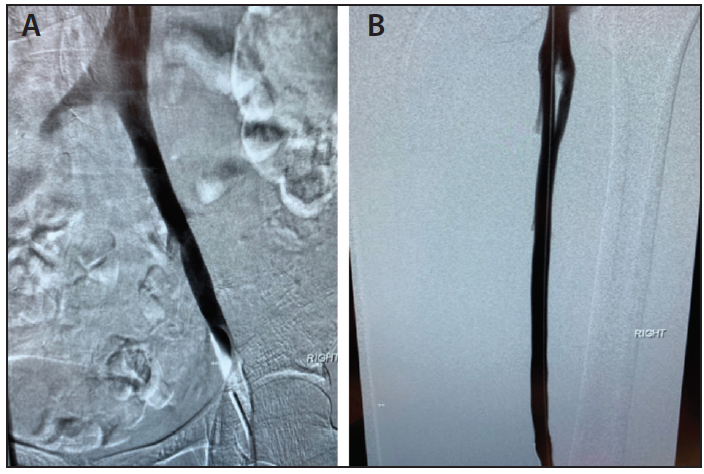 Endovascular thrombus removal for acute iliofemoral deep vein thrombosis. Circulation. 2019;139:1162-1173. 4. Tu T. FLARE clinical study results. Presented at: Society for Cardiovascular Angiography and Interventions (SCAI) 2018; April 25–28, 2018; San Diego, CA. A 65-year-old woman with a history of coronary artery disease presented to the ER with severe right leg swelling and pain. Duplex ultrasonography confirmed the presence of extensive right lower extremity DVT. Her presentation was complicated by a recent coronary artery bypass graft surgery, which ruled out treating with thrombolytics. Figure 1. Initial venogram showing significant thrombus in the iliofemoral (A) and femoral (B) vein. To determine our treatment strategy, we obtained a venogram that revealed thrombus extending from the right common iliac vein down to the distal femoral vein (Figure 1). Based on the severity of edema and the extensive thrombus burden, we decided on immediate treatment via mechanical thrombectomy. Access to the right popliteal vein was achieved under ultrasound guidance. 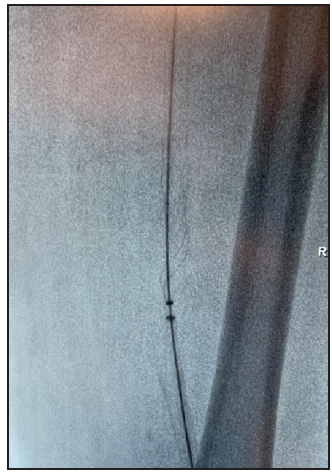 After a 4-F micropuncture sheath was placed, a guidewire was advanced to a 4-F transitional catheter, which was subsequently replaced by a 6-F sheath. Right-sided venograms were obtained to assess both iliocaval and femoropopliteal patency. Next, a 0.035-inch Amplatz Super Stiff guidewire (Boston Scientific Corporation) was advanced through the thrombus into the inferior vena cava and positioned in the internal jugular vein for the ClotTriever procedure. 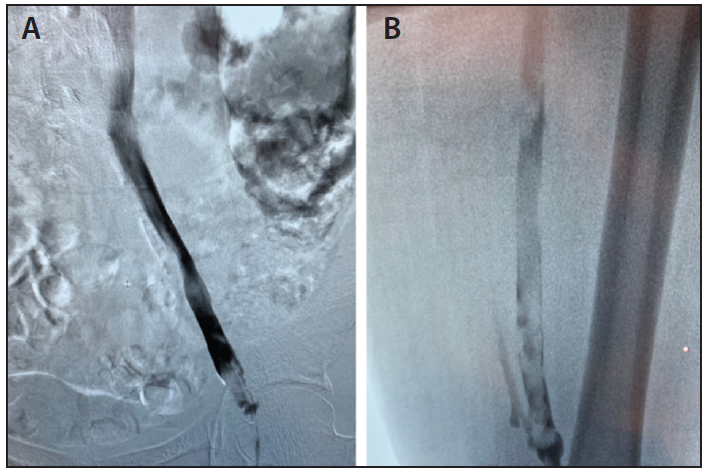 Given the significant clot located inside the popliteal vein, an 8-mm percutaneous transluminal angioplasty balloon was inserted and inflated to prepare the landing zone for the funnel located at the distal tip of the ClotTriever sheath. Figure 2. The ClotTriever catheter during pullback to the sheath funnel. Figure 3. Venogram after ClotTriever thrombectomy showing excellent patency and flow in the iliofemoral (A) and femoral (B) vein. Next, the 6-F sheath was exchanged for a 13-F ClotTriever sheath. The ClotTriever catheter was then inserted over the 0.035-inch guidewire through the sheath and advanced beyond the thrombus in the iliac vein. Once positioned, the catheter was unsheathed to deploy its coring element and attached collection bag. 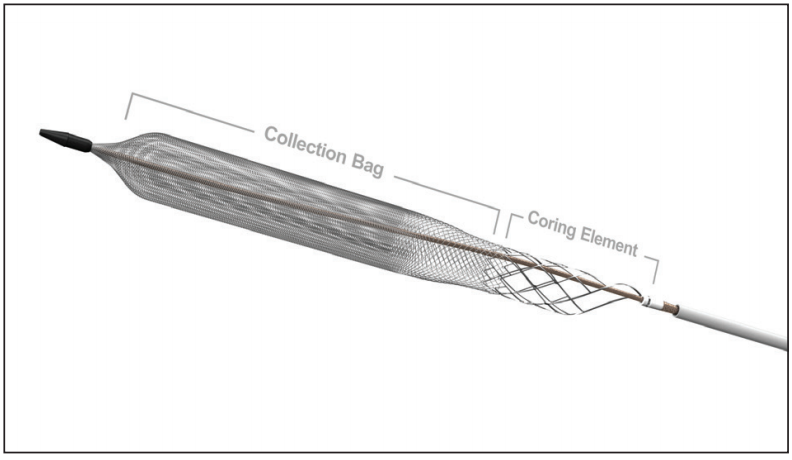 Once the system gained wall apposition above the clot, we slowly pulled the catheter back toward the sheath to separate the clot from the vessel wall and capture it in the collection bag, thus providing embolic protection throughout the pullback (Figure 2). Upon pullback completion, the ClotTriever catheter was collapsed and removed from its sheath. Once externalized, extensive thrombus was removed, and the catheter was flushed to clear for reinsertion. A second pullback was repeated, resulting in additional clot extraction. The subsequent venogram showed significant improvement, with modest clot remaining. To optimize the result and ensure no clot would be left behind, we decided to perform a third run of the ClotTriever. This third run captured the remaining clot, with venographic evidence of full patency and no residual thrombus (Figure 3). The guidewire and sheath were removed, and hemostasis was achieved with manual compression. The total case time was 34 minutes, from puncture to sheath pull. The patient tolerated the procedure well and was discharged the next day with significant improvement in pain and edema. Our center’s early experience with the ClotTriever System has been very encouraging. 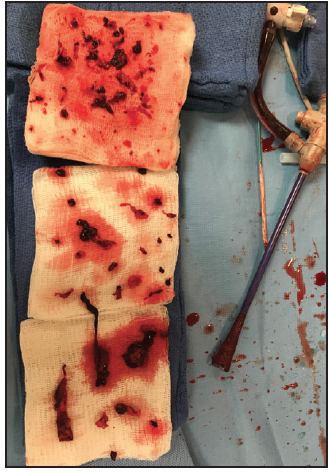 In this case, during a single-session procedure, we completely removed an impressive thrombus burden spanning from the common iliac vein to the access site in a single session, without exposing the patient to the unnecessary risks of thrombolytic drugs (Figure 4). The patient went home the next day with an excellent prognosis, a rapid improvement in pain and swelling, and complete thrombus resolution.